From May 1986: A MARVEL UK House Ad for one of the earliest targeted marketing tie-ins between THE TRANSFORMERS comic and the Hasbro toys. 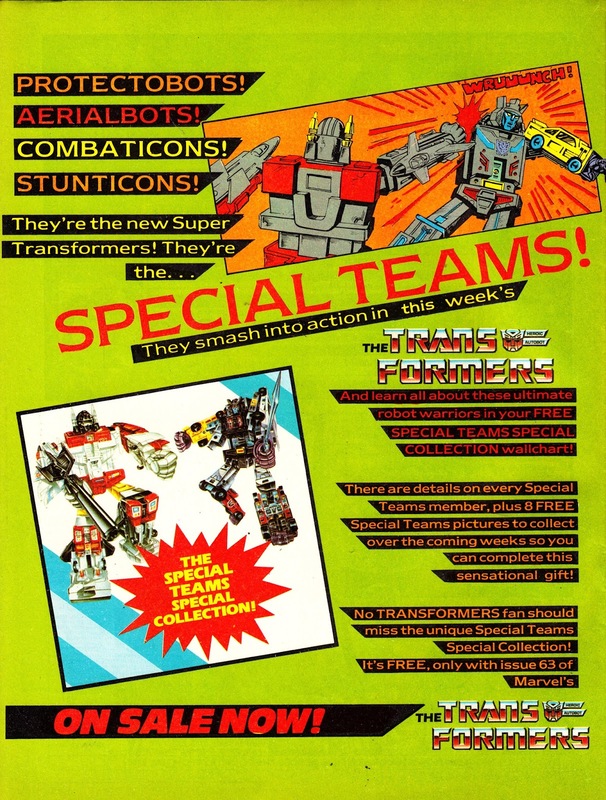 Of course, the whole comic (and all the other gubbins) were always there to flog the toys but Special Teams marked an opportunity to co-ordinate what was happening in stores with Hasbro's marketing machine... and the weekly's storyline. Only one snag... the Special Team characters weren't due to debut in the US strips for a while, and Redan Place couldn't pull them forward without creating a continuity train wreck. So Simon Furman's solution was to create a storyline which introduced the new characters and foreshadowed their official premiere without screwing continuity. Job done. Hasbro happy. Sales bolstered. Probably. This add is also a classic example of Marvel UK design during this period... lots of text boxes with cut corners. The house style appeared a lot on covers and in interiors. and its a style I really liked. Very pleasing to the eye. unlike the m-uk collector editions which have recently removed the cover inbox. the words " if it aint broke, don't fix it " come to mind.